Graham Currie of Attleborough, Norfolk, is a specialist collector, dealer and supplier of Militaria, Antiques & Collectables. He is a registered firearm dealer for Airguns. With over 30 years experience in his field his once passionate hobby rapidly progressed into a thriving business. Where upon in 1989 he opened his current shop in the South Norfolk town of Attleborough. Graham generally specialises in World War 1 and World War 2 Militaria but also has a broad knowledge of all other periods too. Collectable items are sourced from all across the world and represent excellent value for money. Many stock items are suitable for stage & film props & advice can be offered to keep a production looking authentic. Explore our current treasure trove of military items for sale and be sure to add our site to your favourites for our stock is always changing. If you are looking for a particular item then please feel free to enquire as Graham will always try and obtain items for order. 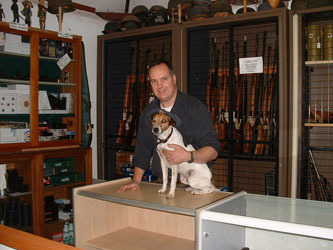 Graham is also a registered firearm dealer for Airguns. These can be purchased only on a ‘face to face’ basis directly from the shop by appointment or sent free of charge to your local firearm dealer. Collectable Military items are always wanted to purchase. We are now able to accept credit & debit card payments by phone.